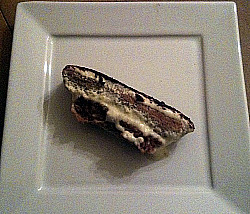 Classic Italian Dessert "Pick Me Up"
This is the perfedt dessert to make for that Italian themed dinner party. 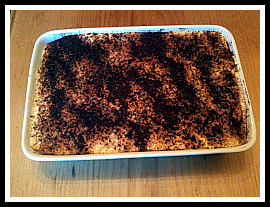 Everyone loves Tiramisu and this is my mother's own recipe! You won't be disappointed and neither will your guests! Allow about 40 minutes to make it and a further 2 hours (min) to chill in the fridge. I wouldn't dare stray from this recipe! You can make the coffee and add a little brandy to it and allow it to cool down. You will also need a dish similar to the one in the picture (left) to make the tiramisu. Separate the egg yokes from the whites. Beat the yokes with sugar until creamy (mixture goes pale). Add the mascapone to the mixture and beat again until creamy again. In a separate dish, beat the egg whites until stiff. Add the egg whites to the mascapone mixture with a wooden spoon and fold in gently. Add the remaining brandy / amaretto to the mixture and mix in. In the dessert dish / tray, put a thin layer of the mascapone mixture covering the bottom of the dish. Dip the biscuits into the cooled coffee mixture quickly (not allowing them to become too soggy) and start to arrange in the tray as a new layer. Continue until you have a full layer of biscuits. Add another layer of the mascapone mixture to cover the biscuit layer. Sprinkle the top with chocolate and place in the fridge to set for at least 2 hours. Serve on plates with a garnish of small berries / fruits and a dusting of icing sugar or chocolate. Again! Don't mess with a classic! There is much debate as to the origins of this dessert. Some say it originates from Siena in Tuscany, others say from Veneto. Some even say it is a modern dessert only dating back as far as the 1980s!